One of the trend styles of the season is the rustic. Perfect for homes in the countryside, it can also be ideal for homes located in the big city, as it offers the feeling of being in nature. In fact, thanks to this type of decoration you can turn your home into the place where you can enjoy comfort and well-being. 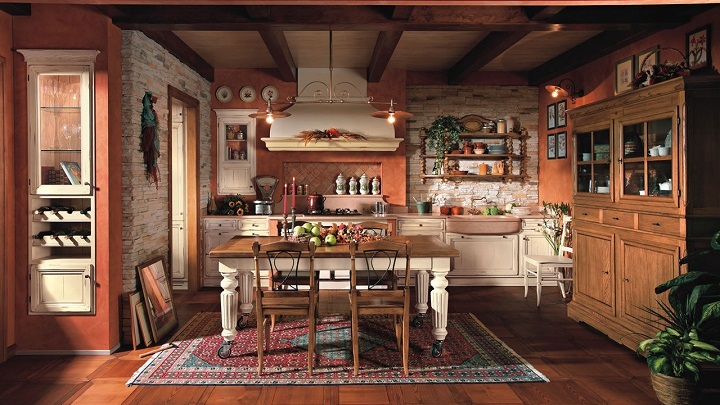 Today we want to help you achieve this by talking about the main keys of the rustic style. Would you like to join us? One of the keys to rustic style decoration is the use of natural materials such as stone, wicker, rattan and ceramics. Wood deserves special mention, which makes it possible for environments to be more welcoming. Therefore, you can use it for both furniture and other elements: floor, walls, beams, accessories, decorative objects … Ideally, you bet on natural wood . If we talk about textiles, linen, wool, leather and cotton predominate. On the other hand, you should know that in rustic-style environments, handmade pieces provide a special value. For example, furniture made by artisans is perfect , especially if they have a worn effect. Of course, you must also incorporate accessories and decorative objects. Other key elements of the rustic style environments are the vintage pieces , which create a perfect harmony with this type of decoration. We refer, for example, to worn-out dressers or towels and cushions with lace. Of course, when we talk about vintage elements we also refer to pieces of aged wood and to pickled or rusted iron furniture. Therefore, when it comes to decorating your home with the rustic style, we recommend visiting antique shops and markets. As for colors, you should bet on those that are linked to nature, such as browns, beige, greens, yellows, ochres and oranges. Of course, darker tones try to use them only in small doses, especially if it is a room with a few square meters. They are also highly recommended pastelshades , especially used in textiles. And if you want to give light to the environment, nothing like white, especially used in ceilings and walls. Of course, the prints also play a very important role in the spaces of rustic style. Above all, floral prints stand out , which are very characteristic of this type of decoration. Not only can you find them in cushions , but in other textiles (curtains, carpets, sheets, quilts …) and on walls through wallpaper. Pictures, stripes or polka dots in bright colors are also quite frequent.